Occasionally, a patient will need to have a restoration that requires their general dentist to have access to a part of the crown of the tooth that is covered by the gingiva. 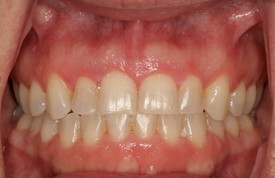 Some examples include a crown or a filling at or right under the gumline. In this case, the dentist will refer the patient to Dr. Mabry who will perfom a procedure known as a Crown Lengthening. Crown Lengthening's are done for a variety of reasons and include Functional and Cosmetic Crown Lengthening's which are defined and explained below. During Functional Crown Lengthening, Dr. Mabry reduces the length of the gums so that the appropriate amount of the crown of the tooth is visible in the mouth. This is usually accomplished by gently reflecting the tissue, moving it to the appropriate level and then suturing the tissue into place. This procedure can be done under local anesthesia or if the patient would be more comfortable can be done under oral-conscious or IV sedation. Any post-operative pain is addressed with prescribed medication. After the area has healed fully, the general dentist may then place the final restoration to restore the tooth. A "gummy smile" may occur if the teeth do not erupt fully into the mouth or if some precipitating event, such as medications, causes growth or hyperplasia of the gums. This can cause pseudo-pocketing of the gum tissue, making it difficult to effectively clean the area . In most cases, it is of great concern esthetically for the patient. During Cosmetic Crown Lengthening, Dr. Mabry reduces the length of the gums so that the appropriate amount of the crown of the tooth is visible in the mouth. This is usually accomplished by gently reflecting the tissue, moving it to the appropriate level and then suturing the tissue into place. This procedure can be done under local anesthesia or if the patient would be more comfortable can be done under oral-conscious or IV sedation. Any post-operative pain is addressed with prescribed medication.